I have drastically shortened and edited the very revealing blurb and recommend you avoid it, as it reveals far too many major plot points in the first quarter of the narrative. Fortunately, I have a policy of not reading blurbs so didn't find my reading experience compromised -- which I'm glad about, because it would have been a real shame. Told in first person viewpoint, Maire is an appealing protagonist who enjoys her job of baking positive emotions and feelings into her cakes. The writing is sensuous and effective, giving a real sense of the process of baking and I completely believed in Maire's pleasure as she cooks magical treats for the people around her. Once she is overtaken by catastrophe, though, the nagging sense of her lost past turns into a burning issue as it is clear the ghostly winged being, who continues visiting her, is desperate for her to regain her memory. The catch is, although he knows who she is, he is unable to tell her -- she has to find out for herself. The premise certainly gripped me, as she also finds herself having to cope with a willful, obstinate being who demands she perform a number of tasks. Shades of familiar fairy tales pervade this tale of loss and longing, as Maire struggles to discover who she used to be -- and how that knowledge can save her. Holmberg weaves an intricate tale with echoes of Hansel and Gretel, the Gingerbread Boy and Frankenstein providing a rich backdrop to Maire's struggles to discover who she is. I really loved the atmosphere she creates -- a slightly heightened tone to the writing that doesn't quite tip into Gothic, but certainly reflects the style of Grimm's tales. The character of Allemas, the main antagonist, is beautifully done and when it becomes clear exactly who he is and his role in Maire's life, I was left with a lump in my throat. One one level, this is a pleasing fantasy tale spun from the lingering wisps of familiar childhood stories, on another -- the themes of loss, yearning and identity twine throughout this thought-provoking book that has been sliding into my head since I've finished reading it. I haven't read anything else Holmberg has written, but after reading Magic Bitter, Magic Sweet I shall definitely be tracking down her other work. 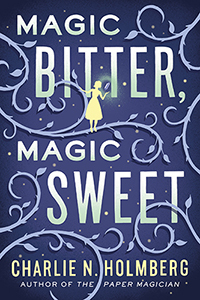 A copy of Magic Bitter, Magic Sweet was provided by the publisher via NetGalley in return for an honest review.